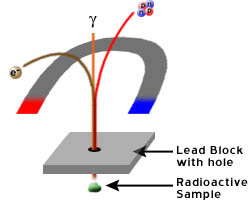 Scientists eventually identified several distinct types of radiation, the particles resulting from radioactive decays. The three types of radiation were named after the first three letters of the Greek alphabet: (alpha), (beta), and (gamma). and the electrically-neutral gamma radiation doesn't curve at all.